David Thomas is a geomorphologist and physical geographer specialising in contemporary drylands and the Quaternary Period. Much of his research has been carried out in Africa, but he also conducts research in Arabia, Asia, India, North America and other dryland contexts. His research has often been multi- and interdisciplinary. On the one hand he has led interdisciplinary projects on desertification, land degradation, sustainable land use and climate change impacts; on the other he works on projects focussed on geomorphological processes, Late Quaternary environmental change, climate change science and environmental-climate interactions, with archaeologists, biologists, climate scientists and other physical geographers. He has authored or edited 10 books, including The Dictionary of Physical Geography (4th edition 2016), Arid Zone Geomorphology (3rd edition 2011), The World Atlas of Desertification (2nd edition 1998), Desertification: exploding the myth (1995) and The Kalahari Environment (1991) and over 200 peer-reviewed journal papers and contributions to edited volumes including IPCC assessment reports. 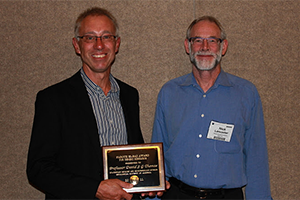 In 2011 David was awarded the Geological Society of America Farouk El-Baz Award, for a body of work that has significantly enhanced desert science. Receiving the Farouk El-Baz Award at the 2011 GSA conference, presented by Prof Nick Lancaster. In 2004 David Thomas was elected Professor of Geography at Oxford, holding the original statutory chair previously occupied by Andrew Goudie, Jean Gottmann, E.W.Gilbert and Kenneth Mason. He is also Professorial Fellow at Hertford College, and was Head of the School of Geography and Environment from 2007- 2011. Prior to returning to Oxford, where he was a student from 1977-84 for undergraduate, Cert. Ed. and D.Phil degrees, David was at Sheffield University, rising from lecturer to Professor in the Department of Geography between 1984 and 1994, founding the Sheffield Centre for International Drylands research in 1994 (Director until 2004) and serving as Head of Department form 1997-2000. In 2006 he was appointed Honorary Professor at the University of Cape Town and in 2013 at the University of the Witwatersrand, both in South Africa. In recent years he has been Vice-President of the Royal Geographical Society (for Research and Higher Education, 2013-16, and Fieldwork and Expeditions, 2002-5). In 2002-2005 he was chair of the British Geomorphological Research Group; when the group was re-established as the British Society for Geomorphology he was elected as one of the founding Fellows, in 2014. From 2014-16 he chaired the RGS International Benchmark Review of UK Physical Geography, and in 2013-14 chaired the Quality Assurance Agency (QAA) Geography Benchmark Statement review which increased the expectation for quantitative analysis and fieldwork in geography degree courses. He was a member of the REF2008 and RAE2014 Geography subpanels and has been a member of similar discipline and university sector reviews overseas. From 2011-14 he was a member of the UK Government Office for Science, Foresight Programme Lead Expert Group, 'Environmental drivers of migration' (final report). 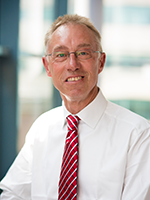 Despite undertaking many internal university and external administrative and executive roles, as well as leading major research projects, David Thomas maintains a significant teaching and doctoral supervision profile and is a member of the management committee of Oxford's NERC-DTP. To date he has supervised over 35 doctoral students to completion, including many now in their own, often senior, academic posts. These include Professors Andy Dougill (Dean of the Faculty of Environment, Leeds University), David Nash (Brighton), Joanna Bullard (Loughborough) and Lindsay Stringer (Leeds), and Drs Jeremy Perkins (Botswana), Chasca Twyman (Sheffield), Andy Carr (Leicester), Brain Chase (CNRS Montpellier), Matt Telfer (Plymouth), Tom Stevens (Uppsala), Alex Arnell (Reading), Susannah Sallu (Leeds), Sallie Burrough (Oxford) and Abi Stone (Manchester). David Thomas has been PI or Co-I on research grants funded by RCUK (NERC and ESRC), The Leverhulme Trust, Fell and Boise Funds totalling almost �9million in value. Most projects employ rigorous fieldwork to generate empirical datasets from environmental contexts that are data-poor. , These data are then analysed with appropriate laboratory (including geochronology) methods; results are often then used in modelling contexts. 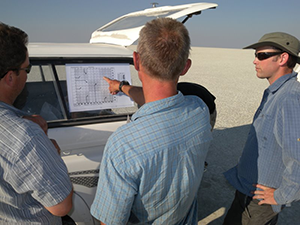 Many field seasons have been spent working on Quaternary environmental change and aeolian process questions in and around the margins of deserts in Africa and other continents, with over 35 years spent working in the interior of southern Africa, especially in and around the extensive Kalahari region. Kalahari fieldwork 1992: sampling for luminescence dating in a dune crest pit in NW Botswana. With the late Stephen Stokes. 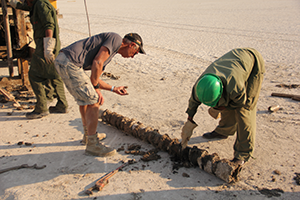 Kalahari fieldwork 2016: inspecting a lake floor sediment pit in Makgadikgadi Pans, Botswana. It is difficult to establish how the world's extensive deserts and drylands have responded to past global climate changes, data that will inform us about potential responses to future climate changes. Many of the traditional Quaternary terrestrial proxy data sources available in other environments, especially those with biological origins, are not available in these dry systems, so we have extensively used geoproxy data (Thomas, 2013; Thomas and Burrough , 2012), from aeolian (dune) and lacustrine (lake shoreline) sediment sources, producing luminescence age records of sedimentary accumulation histories over timescales of up to 250ka. Long standing work in the Kalahari region (parts of Botswana, Namibia, South Africa, Zambia, Zimbabwe) (e.g. Stone and Thomas, 2008, Burrough and Thomas ,2008) has been followed by similar approaches in the Arabia deserts (Leighton et al., 2014), and now in the Thar Desert of India. In the United Arab Emirates mega dune ridges represent a record of aeolian accumulation that is a result of significant environmental changes in the Late Quaternary. 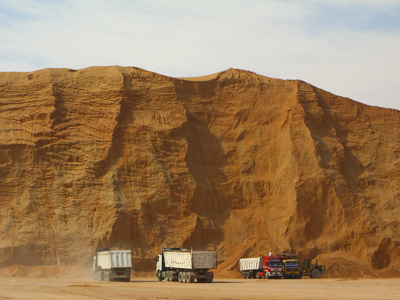 Quarrying of sand for construction presents a unique opportunity to analyse dune interior structures, and to sample for OSL dating in order to develop a record of landscape development in response to climate change. Dune data have contributed to models of potential 21st century dune dynamics in the Kalahari, (Thomas et al., 2005) and we are now exploring new modelling approaches to better interpret the timing and drivers of past desert dune accumulation (Bailey and Thomas, 2013). New approaches are also being tested for extracting geochemical records of long term climate and environmental change from the extensive dry lake systems of the Kalahari, since this desert has not only had geographically extensive active dune systems in the past, but has also supported megalakes up to 60,000ka2 in size. (Burrough, Thomas & Bailey, 2009). Vibracoring Sua Pan lake sediments, 2015. Inspecting sediments from a drill rig core, Ntwetwe pan, 2016. Sedimentological and geochronometric work in southern Africa is also being extended to Quaternary fluvial valley deposits in Namibia, which offer the potential to understand the nature and timing of fluvial dynamics within the world's driest desert region. We are also exploring ways to use luminescence dating to analyse dryland land surface responses to drought, working in Nebraska, as well as projects looking at improving knowledge on the origins and deposition timing of European loess. Deserts are full of evidence of the presence of early humans and even early civilisations. Environmental and climatic ('hydroclimate') dynamics in the past have made areas that appear inhabitable and inhospitable today more attractive for opportunistic and persistent human presence in the past. This theme is currently being investigated through collaborative research with archaeologists and palaeoscientists in two differing contexts: the landscape archaeology of the Kalahari of Botswana and the ancient Indus civilisation of the Thar Desert, while other research has occurred in the context of 'green Arabia' in the United Arab Emirates (Preston, Thomas et al., 2015). 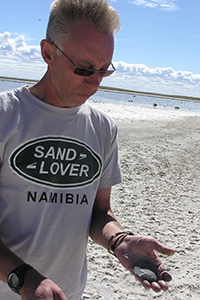 David Thomas is currently Principal Investigator on the Leverhulme Trust-funded project 'Landscape archaeology of the Kalahari: How did major hydrological shifts affect Stone Age mobility and landscape use in the late Quaternary?'. The core aim is to provide the first systematic analysis of the neglected Stone Age archaeology of the Middle Kalahari, central southern Africa, and its raw material source areas, in relation to the region's hydrological history. 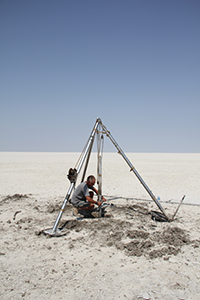 We are innovatively combining geochemical, field archaeological and palaeoenvironmental methods to provide the first analysis of Stone Age responses to the major hydrological changes that the Kalahari has experienced over the last ~100ka. 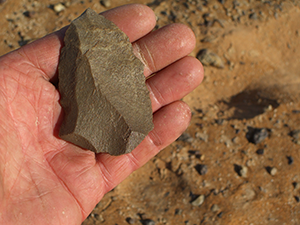 Lithics in the desert: there is substantial evidence of early human presence even in today's hyper-arid regions. This artefact is in the Namib Sand Sea. 2007. 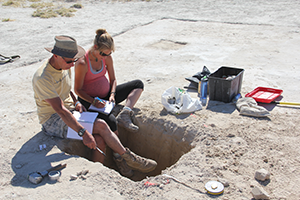 Leverhulme Makgadikgadi project field archaeology team, Ntwetwe Pan, 2016. Lithics in the desert: a find in the Kalahari in 2011 during fieldwork that led to the current project funded by the Leverhulme Trust. In the Thar Desert we are working with archaeologists to provide data on the nature and timing of the landscape dynamics associated with mid-Holocene Indus population changes, as part of wider assessments of both the regions complex history of monsoon dynamics and the postulated collapse of urban civilisations around 4000ka ago (Durcan and Thomas in press). 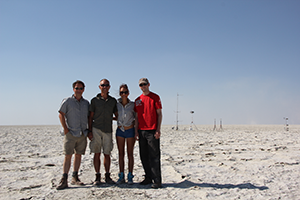 David Thomas was a Co-I on the NERC-funded DO4Models project that investigated drivers of terrestrial desert dust sources into the atmosphere, as part of a wider initiative to improve the incorporation of mineral dust components in global climate models. 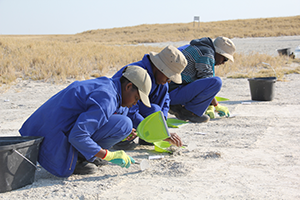 Engaged with the extensive field monitoring and data collection component of the project in the Makgadikgadi basin, Botswana and the dry valleys of western Namibia, the project has led to additional developments that are investigating the critical role of mineral desert dust in ocean fertilisation (Dansie , Thomas et al., submitted), and the Holocene origins and sustainability of dust sources on land (Thomas et al., 2016, submitted). One of the dust and meteorological stations erected on Sua Pan as part of the DO4Models project, 2012. Checking site locations on Sua pan as part of the DO4Models project, 2011..
David has along track record of research into modern land degradation in drylands and its interactions with human activities (e.g. Stringer, Twyman and Thomas, 2007) and climate dynamics (Thomas, 2008), including recent work in Africa (King and Thomas, 2014) and Mongolia (e.g. Sternberg, Thomas and Middleton 2010), and that which might related environmental changes to human movements (Arnall, Thomas et al., 2013; Geddes et al., 2012). Nomadic herders in the Gobi Desert, Mongolia. From 2002-5 he was the principal investigator on a major research project funded by the Tyndall Centre for Climate Change Research. The project investigated how natural resource-dependant societies in the developing world, particularly southern Africa, respond and adapt to climatic variability and shocks such as drought and floods, and how these responses may better inform an understanding of likely 21st century responses to global warming-induced climate change (Thomas et al., 2009). This was a truly interdisciplinary project that brought together social and environmental scientists including climate and vegetation modellers. Key outcomes included work on learning processes in adaptation, changing use of ecosystem resources, and equity and justice issues (Thomas and Twyman, 2005). A major news item was published in Nature (12 April 2007) on this research. INQUA's Dunes Atlas project that has developed an open source global digital database of chronological records of sand dune accumulation and stabilisation. Over 6000 luminescence ages have been produced from desert dune systems worldwide, creating data with the potential to explore desert responses to climate change across the globe (Lancaster, Wolfe, Thomas, et al., 2016; Thomas and Burrough, 2016). The Leverhulme Trust's SPAN the Atlantic programme, which initiates collaborations and shares research approaches between archaeologists and environmental scientists working in South American and southern Africa. 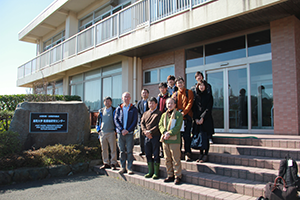 Visit to Tottori University Arid Lands Research Centre, Japan, 2016. Funded by NERC and in collaboration with Prof. Richard Washington, Dr Giles Wiggs, the University of Sheffield and Imperial College London (2010-2014). Funded by The Leverhulme Trust and in collaboration with Dr Sallie Burrough and Prof. Kathy Willis (Dept. of Zoology, Oxford) (2010-2013). Funded by the Boise Fund and in collaboration with Dr Sallie Burrough. In collaboration with Dr Richard Bailey; financial support from NERC. Funded by the RGS and NERC, with Professor Andrew Goudie, Professor Adrian Parker (Oxford Brookes), Dr Richard Bailey, and postgraduates. In collaboration with Professor Richard Washington, Professor Kate Brown (University of East Anglia), and Dr Henny Osbahr (University of Reading); Financial support from Tyndall Centre (2006-2009). Chronology, adaptation and environment of the Middle Palaeolithic in northern Africa. In collaboration with Dr Geoff Duller (Aberystwyth), Libyan Palaeolake Project, Dr Simon Armitage (formerly PDRA, now lecturer at Royal Holloway); Financial support from NERC EFCHED programme; D.Phil. Students: Sallie Burrough (2002-2006). David teaches on Undergraduate, Masters and doctorate programmes in the School. At the undergraduate level, he lectures on the 'The Geographical Environment: Physical' core course, and contribute half of the teaching in the 'Quaternary Period' and 'Dryland Environments' Options for the Final Honour School. He delivers an MSc elective on water and civilisation with Professor Mike Edmunds. Impact of veterinary fences on environment and society in northern Botswana. Effect of water and land use change on the Mongolian environment. Multi-proxy reconstruction of late Quaternary climate dynamics in western Southern Africa. Late Quarternary paleolacustrine environments in the Middle Kalahari, Botswana. Late Quaternary climate recorded in Chinese loess: OSL analysis of record continuity and preservation. Thomas, D.S.G. (ed.) (2016) The Dictionary of Physical Geography, 4th Edition. Wiley-Blackwell. ISBN: ISBN: 978-1-118-78233-0. Thomas, D.S.G. 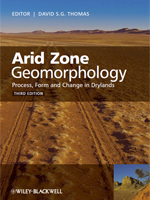 (2011) Arid Zone Geomorphology: Process, Form and Change in Drylands, 3rd Edition. Wiley. pp. 648. ISBN: 9780470519080. Blockley, S.P.E., Lane, C.S., Oh, A., Ditchfield, P., Bogaard, A., Langdon, P.G., Schreve, D.C., Thomas, D.S.G. and Bailey, R.M. (eds.) (2009) Quaternary Abstracts: The human dimension in rapid environmental change. Quaternary Research Association, Annual Discussion Meeting January 2009, Oxford. Sporton, D. and Thomas, D.S.G. (2002) Sustainable livelihoods in Kalahari Environments: contributions to global debates. OUP, Oxford. Thomas, D.S.G. and Goudie, A.S. (2000) The Dictionary of Physical Geography. Blackwell. pp. 624. Middleton, N.J. and Thomas, D.S.G. (1997) World Atlas of Desertification 2nd Ed. Edward Arnold, London. pp. 182. Thomas, D.S.G. (1997) Arid Zone Geomorphology, 2nd Ed. Wiley. pp. 732. Thomas, D.S.G. 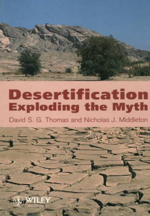 and Middleton, N.J. (1994) Desertification: Exploding the Myth. Wiley. pp. 208. Thomas, D.S.G. 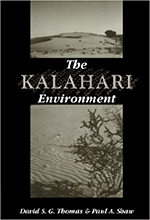 and Shaw, P. (1991) The Kalahari Environment. CUP. Buckland, C.E., Bailey, R.M. and Thomas, D.S.G. (2018) Identifying chronostratigraphic breaks in aeolian sediment profiles using near-surface luminescence dating and changepoint analysis. Quaternary Geochronology, 46: 45-58. Dansie, A.P., Thomas, D.S.G., Wiggs, G.F.S. and Munkittrick, K.R. (2018) Spatial variability of ocean fertilising nutrients in the dust-emitting ephemeral river catchments of Namibia. Earth surface processes and landforms, 43: 563-578. Makondo, C.C. and Thomas, D.S.G. (2018) Climate change adaptation: Linking indigenous knowledge with western science for effective adaptation. Environmental Science and Policy, 88: 83-91. Rowell, A.L.K., Thomas, D.S.G., Bailey, R.M. and Holmes, P.J. (2018) Sand ramps as palaeoenvironmental archives: Integrating general principles and regional contexts through reanalysis of the Klipkraal Sands, South Africa. Geomorphology. Brown, A.G., Tooth, S., Bullard, J.E., Thomas, D.S.G., Chiverrell, R.C., Plater, A.J., Murton, J., Thorndycraft, V.R., Tarolli, P., Rose, J., Wainwright, J., Downs, P. and Aalto, R. (2017) The geomorphology of the Anthropocene: emergence, status and implications. Earth Surface Processes and Landforms, 42(1): 71-90. Dansie, A.P., Wiggs, G.F.S. and Thomas, D.S.G. (2017) Iron and nutrient content of wind-erodible sediment in the ephemeral river valleys of Namibia. Geomorphology, 290: 335-346. Nield, J.M., Wiggs, G.F.S., King, J., Bryant, R.G., Eckardt, F.D., Thomas, D.S.G. and Washington, R. (2017) Climate-surface-pore-water interactions on a salt crusted playa: implications for crust, 10 pattern and surface roughness development measured using terrestrial laser scanning. Earth surface processes and landforms, 41: 738-753. Thomas, D.S.G. and Bailey, R.M. (2017) Is there evidence for global-scale forcing of southern hemisphere Quaternary desert dune accumulation? A quantitative method for testing hypotheses of dune system development. Earth Surface Processes and Landforms. Thomas, D.S.G., Durcan, J.A., Dansie, A. and Wiggs, G.F.S. (2017) Holocene fluvial valley fill sources of atmospheric mineral dust in the Skeleton Coast, Namibia. Earth Surface Processes and Landforms, 42: 1884-1894. Lancaster, N., Wolfe, S., Thomas, D., Bristow, C., Bubenzer, O., Burrough, S., Duller, G., Halfen, A., Hesse, P., Roskin, J., Singhvi, A., Tsoar, H., Tripaldi, A., Yang, X. and Zárate, M. (2016) The INQUA Dunes Atlas chronologic database. Quaternary International, 410(B): 3-10. Nield, J.M., Wiggs, G.F.S., King, J., Bryant, R.G., Eckardt, F.D., Thomas, D.S.G. and Washington, R. (2016) Climate-surface-pore-water interactions on a salt crusted playa: implications for crust pattern and surface roughness development measured using terrestrial laser scanning. Earth Surface Processes and Landforms, 41(6): 738-753. Thomas, D.S.G. and Burrough, S.L. (2016) Luminescence-based dune chronologies in southern Africa: Analysis and interpretation of dune database records across the subcontinent. Quaternary International, 410 B: 30-45. Adger, W.N., Arnell, N., Black, R., Dercon, S., Geddes, S., Hunter, L. and Thomas, D.S.G. (2015) Focus on Environmental Risks and Migration: Causes and Consequences. Environmental Research Letters, 10. Preston, G., Thomas, D.S.G., Goudie, A.S., Atkinson, O., Leng, M.J., Hodson, M., Walkington, H., Charpentier, V., Mery, S., Borgi, F. and Parker, A.G. (2015) A multi-proxy analysis of the Holocene humid phase from the United Arab Emirates and its implications for southeast Arabia's Neolithic populations. Quaternary International, 382: 277-292. Stone, A.E.C., Bateman, M.D. and Thomas, D.S.G. (2015) Rapid age assessment in the Namib Sand Sea using a portable luminescence reader. Quaternary Geochronology, 30(B): 134-140. Yu, H.H., Edmunds, M., Lora-Wainwright, A. and Thomas, D. (2015) Governance of the irrigation commons under integrated water resources management – A comparative study in contemporary rural China. Environmental Science and Policy, 55(1): 65-74. King, C. and Thomas, D.S.G. (2014) Monitoring environmental change and degradation in the irrigated oases of the Northern Sahara. Journal of Arid Environments, 103: 36-45. Leighton, C.L., Bailey, R.M. and Thomas, D.S.G. (2014) Interpreting and modelling late Quaternary dune accumulation in the southern Arabian Peninsula. Quaternary Science Reviews, 102: 1-13. Livingstone, I., Baas, A., Bateman, M.D., Bristow, C., Bryant, R.G., Bullard, J.E., Nield, J.M., Thomas, D.S.G., White, K.H. and Wiggs, G.F.S. (2014) A prospectus for future geomorphological investigation of the Namib Sand Sea. Transactions of the Royal Society of South Africa, 69(3): 1-6. Middleton, N., Rueff, H., Sternberg, T., Batbuyan, B. and Thomas, D. (2014) Explaining spatial variations in climate hazard impacts in western Mongolia. Landscape Ecology, 30(1): 91-107. Nield, J., Wiggs, G.F.S., Bryant, R., King, J., Thomas, D.S.G. and Washington, R. (2014) The dynamism of salt crust patterns on playas. Geology, 43(1): 31-34. Yu, H., Edmunds, M., Lora-Wainwright, A. and Thomas, D. (2014) From principles to localized implementation: villagers' experiences of IWRM in the Shiyang River basin, Northwest China. International Journal of Water Resources Development, 30(3): 588-604. Arnall, A., Thomas, D.S.G., Twyman, C. and Liverman, D. (2013) Flooding, resettlement and change in livelihoods: evidence from rural Mozambique. Disasters, 37(3): 468-488. Arnall, A., Thomas, D.S.G., Twyman, C. and Liverman, D. (2013) NGOs, elite capture and community driven development: perspectives in rural Mozambique. The Journal of Modern African Studies, 51: 305-330. Atkinson, O.A.C., Thomas, D.S.G., Parker, A.G. and Goudie, A.S. (2013) Late Quaternary humidity and aridity dynamics in the northeast Rub’ al-Khali, United Arab Emirates: Implications for early human dispersal and occupation of eastern Arabia. Quaternary International, 300: 292-301. Burrough, S.L. and Thomas, D.S.G. (2013) Central southern Africa at the time of the African Humid Period: A new analysis of Holocene palaeoenvironmental and palaeoclimate data. Quaternary Science Review, 80: 29-46. Leighton, C.L., Bailey, R.M. and Thomas, D.S.G. (2013) The utility of desert sand dunes as Quaternary chronostratigraphic archives: evidence from the northeast Rub' al Khali. Quaternary Science Reviews, 78: 303-318. Leighton, C.L., Thomas, D.S.G. and Bailey, R.M. (2013) Reproducibility and utility of dune luminescence chronologies. Earth-Science Reviews, 129: 24-39. Stone, A.E.C. and Thomas, D.S.G. (2013) Casting new light on late Quaternary environmental and palaeohydrological change in the Namib Desert: A review of the application of optically stimulated luminescence in the region. Journal of Arid Environments, 93: 40-58. Thomas, D.S.G. (2013) Reconstructing paleoenvironments and palaeoclimates in drylands: what can landform analysis contribute? Earth Surface Processes and Landforms, 38(1): 3-16. State of Science issue. Burrough, S.L., Thomas, D.S.G., Bailey, R.M. and Davies, L. (2012) From landform to process: morphology and formation of lake-bed barchan dunes, Makgadikgadi, Botswana. Geomorphology, 161-162: 1-14. Holmes, P.J., Thomas, D.S.G., Bateman, M.D., Wiggs, G.F.S. and Rabumbulu, M. (2012) Evidence for land degradation from aeolian sediment in the west-central Free State Province, South Africa. Land Degradation and Development, 23(6): 601-610. Thomas, D.S.G. and Burrough, S. (2012) Interpreting geoproxies of late Quaternary climate change in African drylands: implications for understanding environmental change and early human behaviour. Quaternary International, 253: 5-17. Thomas, D.S.G., Burrough, S. and Parker, A.G. (2012) Extreme events as drivers of early human behaviour in Africa? The case for variability, not catastrophic drought. Journal of Quaternary Science, 27(1): 7-12. Atkinson, O.A.C., Thomas, D.S.G., Goudie, A.S. and Bailey, R.M. (2011) Late Quaternary chronology of major dune ridge development in the northeast Rub' al-Khali, United Arab Emirates. Quaternary Research, 76(1): 93-105. Black, R., Adger, W.N., Arnell, N.W., Dercon, S., Geddes, A. and Thomas, D.S.G. (2011) Editorial: Migration and global environmental change. Global Environmental Change, 21(1): 1-2. Black, R., Adger, W.N., Arnell, N.W., Dercon, S., Geddes, A. and Thomas, D.S.G. (2011) The effect of environmental change on human migration. Global Environmental Change, 21(1): 3-11. Chase, B.M., Quick, L.J., Meadows, M.E., Scott, L., Thomas, D.S.G. and Reimer, P.J. (2011) Late glacial interhemispheric climate dynamics revealed in South African hyrax middens. Geology, 39(1): 19-22. Thomas, D.S.G. (2011) Grove AT (1969) Landforms and climate change in the Kalahari and Ngamiland. Progress in Physical Geography, 35(2): 263-266. Livingstone, I., Bristow, C., Bryant, R.G., Bullard, J., White, K., Wiggs, G.F.S., Baas, A.C.W., Bateman, M.D. and Thomas, D.S.G. (2010) The Namib Sand Sea digital database of aeolian dunes and key forcing variables. Aeolian Research, 2(2-3): 93-104. Sternberg, T., Thomas, D.S.G. and Middleton, N. (2010) Drought dynamics on the Mongolian steppe, 1970-2006. International Journal of Climatology, 31(12): 1823-1830. Sternberg, T., Tsolmon, R., Middleton, N. and Thomas, D.S.G. (2010) Tracking desertification on the Mongolian steppe through NDVI and field-survey data. International Journal of Digital Earth, 4(1): 50-64. Stone, A.E.C., Thomas, D.S.G. and Viles, H.A. (2010) Late Quaternary palaeohydrological changes in the northern Namib Sand Sea: New chronologies using OSL dating of interdigitated aeolian and water-lain interdune deposits. Palaeogeography, Palaeoclimatology, Palaeoecology, 288(1-4): 35-53. Telfer, M.W., Bailey, R.M., Burrough, S.L., Stone, A.E.C., Thomas, D.S.G. and Wiggs, G.S.F. (2010) Understanding linear dune chronologies: Insights from a simple accumulation model. Geomorphology, 120(3-4): 195-208. Burrough, S.L., Thomas, D.S.G. and Bailey, R.M. (2009) Mega-lake in the Kalahari: a late Pleistocene record of the palaeolake Makgadikgadi system. Quaternary Science Reviews, 28(15-16): 1392-1411. Burrough, S.L., Thomas, D.S.G. and Singarayer, J.S. (2009) Late Quaternary hydrological dynamics in the middle Kalahari: forcing and feedbacks. Earth Science Reviews, 96(4): 313-326. Chase, B.M., Meadows, M.E., Scott, L., Thomas, D.S.G., Marais, E., Sealy, J. and Reimer, P.J. (2009) A record of rapid Holocene climate change preserved in hyrax middens from southwestern Africa. Geology, 37(8): 703-706. Sallu, S.M., Twyman, C. and Thomas, D.S.G. (2009) The multidimensional nature of biodiversity and social dynamics and implications for contemporary rural livelihoods in remote Kalahari settlements, Botswana. African Journal of Ecology, 47(1): 110-118. Sternberg, T., Middleton, N. and Thomas, D.S.G. 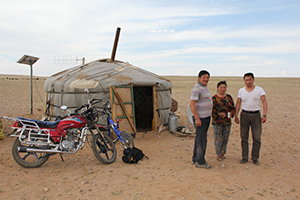 (2009) Pressurised pastoralism in South Gobi, Mongolia: what is the role of drought? Transactions of the Institute of British Geographers, 34(3): 364-377. Telfer, M.W., Thomas, D.S.G., Parker, A.G., Walkington, H. and Finch, A.A. (2009) Optically Stimulated Luminescence (OSL) dating and palaeoenvironmental studies of pan (playa) sediment from Witpan, South Africa. Palaeogeography, Palaeoclimatology, Palaeoecology, 273(1-2): 50-60. Burrough, S.L. and Thomas, D.S. (2008) Late Quaternary lake-level fluctuations in the Mababe depression: Middle Kalahari palaeolakes and the role of Zambezi inflows. Quaternary Research, 69(3): 388-403. Burrough, S.L. and Thomas, D.S.G. (2008) Geomorphological contributions to palaeolimnology on the African continent. Geomorphology, 103(3): 285-298. Flores-Flores, J.L., Santha, S.D., Thomas, D.S.G., Safriel, U.N., Eswaran, H., Solh, M., Davies, J., Kowsar, S.A. and Bissonnette, J-F. (2008) Experts address the question: are poverty and land degradation inevitable in desert-prone areas? Natural Resources Forum, 32(1): 77-80. Holmes, P.J., Bateman, M.D., Thomas, D.S.G., Telfer, M.W., Barker, C.H. and Lawson, M.P. (2008) A Holocene-late Pleistocene aeolian record from lunette dunes of the western Free State panfield, South Africa. The Holocene, 18(8): 1193-1205. Osbahr, H., Twyman, C., Adger, W.N. and Thomas, D.S.G. (2008) Effective livelihood adaptation to climate change disturbance: scale dimensions of practice in Mozambique. Geoforum, 39(6): 1951-1964. Stevens, T., Lu, H., Thomas, D.S.G. and Armitage, S.J. (2008) Optical dating of abrupt shifts in the Late Pleistocene East Asian monsoon. Geology, 36(5): 415-418. Stone, A.E.C. and Thomas, D.S.G. (2008) Linear dune accumulation chronologies from the southwest Kalahari, Namibia: challenges of reconstructing late quaternary palaeoenvironments from aeolian landforms. Quaternary Science Reviews, 27(17-18): 1667-1681. Thomas, D.S.G. and Wiggs, G.F.S. (2008) Aeolian systems responses to global change: challenges of scale, process and temporal integration. Earth Surface Processes and Landforms, 33(9): 1396-1418. Thomas, D.S.G., Bailey, R.M., Shaw, P.A., Durcan, J.A. and Singarayer, J.S. (2008) Late Quaternary highstands at Lake Chilwa, Malawi: frequency, timing and possible forcing mechanisms in the last 44 ka. Quaternary Science Reviews, 28(5-6): 526-539. Burrough, S.L., Thomas, D.S.G., Shaw, P.A. and Bailey, R.M. (2007) Multiphase Quaternary highstands at Lake Ngami, Kalahari, northern Botswana. Palaeogeography, Palaeoclimatology, Palaeoecology, 253(3-4): 280-299. Chase, B., Thomas, D.S.G., Bateman, M.D. and Meadows, M.E. (2007) Late Quaternary dune development along the western margin of South Africa and its relationship to paleoclimatic changes inferred from the marine record. Pages, 15(2): 26-27. Chase, B.M. and Thomas, D.S.G. (2007) Multiphase late Quaternary aeolian sediment accumulation in western South Africa: Timing and relationship to palaeoclimatic changes inferred from the marine record. Quaternary International, 166(1): 29-41. Lai, Z., Wintle, A.G. and Thomas, D.S.G. (2007) Rates of dust deposition between 50 ka and 20 ka revealed by OSL dating at Yuanbao on the Chinese loess plateau. Palaeogeography, Palaeoclimatology, Palaeoecology, 248(3-4): 431-439. Stevens, T., Thomas, D.S.G., Armitage, S.J., Lunn, H.R. and Lu, H. (2007) Reinterpreting climate proxy records from late Quaternary Chinese loess: a detailed OSL investigation. Earth-Science Reviews, 80(1-2): 111-136. Stringer, L.C., Thomas, D.S.G. and Twyman, C. (2007) From global politics to local land users: applying the United Nations Convention to combat desertification in Swaziland. The Geographical Journal,, 173(2): 129-142. Stringer, L.C., Twyman, C. and Thomas, D.S.G. (2007) Combating land degradation through participatory means: the case of Swaziland. Ambio, 36(5): 387-393. Stringer, L.C., Twyman, C. and Thomas, D.S.G. (2007) Learning to reduce degredation on Swaziland's arable land: enhancing understandings of Striga asiatica. Land Degredation and Development, 18(2): 163-177. Telfer, M.W. and Thomas, D.S.G. (2007) Late Quaternary linear dune accumulation and chronostratigraphy of the southwestern Kalahari: implications for aeolian palaeoclimatic reconstructions and predictions of future dynamics. Quaternary Science Reviews, 26(19-21): 2617-2630. Thomas, D.S.G., Twyman, C., Osbahr, H. and Hewitson, B. (2007) Adaptation to climate change and variability: farmer responses to intra-seasonal precipitation trends in South Africa. Climatic Change, 83(3): 301-322. Carr, A.S., Thomas, D.S.G. and Bateman, M.D. (2006) Climatic and sea level controls on Late Quaternary eolian activity on the Agulhas Plain, South Africa. Quaternary Research, 65(2): 252-263. Carr, A.S., Thomas, D.S.G., Bateman, M.D., Meadows, M.E. and Chase, B. (2006) Late Quaternary palaeoenvironments of the winter-rainfall zone of southern Africa: Palynological and sedimentological evidence from the Agulhas Plain. Palaeogeography, Palaeoclimatology, Palaeoecology, 239(1-2): 147-165. Chase, B. and Thomas, D.S.G. (2006) Late Quaternary dune accumulation along the western margin of South Africa: distinguishing forcing mechanisms through the analysis of migratory dune forms. Earth and Planetary Science Letters, 251(3-4). Chase, B., Thomas, D.S.G., Bateman, M.D. and Meadows, M.E. (2006) Late Quaternary aeolian activity along the west coast of South Africa. Geophysical Research Abstracts,, 8. Stevens, T., Armitage, S.J., Lu, H. and Thomas, D.S.G. (2006) Sedimentation and diagenesis of Chinese loess: Implications for the preservation of continuous, high-resolution climate records. Geology, 34(10): 849-852. Telfer, M. and Thomas, D.S.G. (2006) Spatial and temporal complexity of lunette dune development, Witpan, South Africa: implications for palaeoclimate and models of pan development in arid regions. Geology, 34(10): 853-856. Telfer, M.W. and Thomas, D.S.G. (2006) Complex Holocene lunette dune development, South Africa: Implications for paleoclimate and models of pan development in arid regions. Geology, 34(10): 853-856. Thomas, D.S.G. and Leason, H.C. (2005) Dunefield activity response to climate variability in the southwest Kalahari. Geomorphology, 64: 117-132. Thomas, D.S.G. and Twyman, C. (2005) Equity and justice in climate change adaptation amongst natural resource dependant societies. Global Environmental Change, 15(2): 115-124. Thomas, D.S.G., Knight, M. and Wiggs, G.F.S. (2005) Remobilization of southern African desert dune systems by twenty-first century global warming. Nature, 435: 1218-1221. Thomas, D.S.G. and Twyman, C. (2004) Good or bad rangeland? Hybrid knowledge, science and local understandings of vegetation dynamics in the Kalahari. Land Degradation and Rehabilitation, 15: 215-231. Bateman, M.D., Thomas, D.S.G. and Singhvi, A.K. (2003) Preservation of aridity records for the last 300 ka in southwest Kalahari aeolian sediments. Quaternary International, 111: 37-50. Shaw, P.A., Bateman, M.D. Thomas, D.S.G. and Davies, F. (2003) Holocene fluctuations Lake Ngami, Middle Kalahari: chronology and responses to climate change. Quaternary International, 111(1): 23-35. Thomas, D.S.G., Brook, G., Shaw, P.A., Bateman, M., Haberyan, K., Appleton, C., Nash, D., McLaren, S. and Davies, F. (2003) Late Pleistocene wetting and drying in the NW Kalahari: an integrated study from the Tsodilo Hills, Botswana. Quaternary International, 104: 53-67. Twyman, C., Sporton, D. and Thomas, D.S.G. (2003) Where is the life in farming? : Poverty and livelihoods on the margins of the Kalahari. Geoforum, 35: 69-85. Dougill, A.J., Twyman, C., Thomas, D.S.G. and Sporton, D. (2002) Soil degradation assessment in mixed farming systems of southern Africa: use of nutrient balance studies for participatory degradation monitoring. Geographical Journal, 68: 195-210. Lawson, M.P. and Thomas, D.S.G. (2002) Lunette dune development chronologies in the SW Kalahari. Quaternary Science Reviews, 21(7): 825-836. Thomas, D.S.G. and Shaw, P.A. (2002) Late Quaternary environmental change in central southern Africa: new data, synthesis, issues and prospects. Quaternary Science Reviews, 21(7): 783-798. Thomas, D.S.G., Holmes, P.J., Bateman, M.D. and Marker, M.E. (2002) Geomorphic evidence for late Quaternary environmental change from the eastern Great Karoo margin, South Africa. Quaternary International, 89(1): 151-164. Twyman, C., Dougill, A., Sporton, D. and Thomas, D.S.G. (2002) Community fencing in open rangelands self-empowerment in eastern Namibia. Review of African Political Economy, 27: 9-26. Thomas, D.S.G. (2016) Desert dune environments. Chapter 10 in, Knight, J. and Grab, S.W. (eds.) Quaternary Environmental Change in Southern Africa: Physical and Human Dimensions. Cambridge University Press, Cambridge. ISBN: 9781107055797. Thomas, D.S.G. (2013) Aeolian Paleoenvironments of Desert Landscapes. In, Schroder, J.F. (ed.) Treatise on Geomorphology (Volume 11). Elsevier Inc. pp. 356-374. ISBN: 978-0-08-088522-3. Thomas, D.S.G. (2012) Desert Diversity and Challenges. 16. Conclusions: in, Mol, L. and Sternberg, T. (eds.) Changing Deserts: Integrating People and Their Environment. White Horse Press, Cambridge. 346 pp. ISBN: 978-1-874267-69-0. Thomas, D.S.G. and Shaw, P.A. (2012) Terminal Basins: Lacustrine and Pan Systems. Chapter 7 in, Holmes, P. and Meadows, M. (eds.) Southern African Geomorphology: Recent Trends and New Directions. Sun Media, Bloemfontein. pp. 167-189. ISBN: 978-1-920382-02-5. Thomas, D.S.G. and Wiggs, G.F.S. (2012) Aeolian Systems. Chapter 6 in, Holmes, P. and Meadows, M. (eds.) Southern African Geomorphology: Recent Trends and New Directions. Sun Media, Bloemfontein. pp. 141-166. ISBN: 978-1-920382-02-5. Thomas, D.S.G. (2011) Aeolian landscapes and bedforms. Chapter 17 in, Thomas, D.S.G. (ed.) Arid Zone Geomorphology: Process, Form and Change in Drylands, 3rd Edition. Wiley. 648 pp. ISBN: 9780470519080. Thomas, D.S.G. (2011) Arid environments: their nature and extent. Chapter 1 in, Thomas, D.S.G. (ed.) Arid Zone Geomorphology: Process, Form and Change in Drylands, 3rd Edition. Wiley. 648 pp. ISBN: 9780470519080. Thomas, D.S.G. (2011) Dryland system variability. Chapter 4 in, Thomas, D.S.G. (ed.) Arid Zone Geomorphology: Process, Form and Change in Drylands, 3rd Edition. Wiley. 648 pp. ISBN: 9780470519080. Thomas, D.S.G. and Burrough, S.L. (2011) Climatic frameworks: legacies from the past. Chapter 3 in, Thomas, D.S.G. (ed.) Arid Zone Geomorphology: Process, Form and Change in Drylands, 3rd Edition. Wiley. 648 pp. ISBN: 9780470519080. Washington, R. and Thomas, D.S.G. (2011) Future climate change and arid zone geomorphology. Chapter 24 in, Thomas, D.S.G. (ed.) Arid Zone Geomorphology: Process, Form and Change in Drylands, 3rd Edition. Wiley. 648 pp. ISBN: 9780470519080. Burrough, S. and Thomas, D.S.G. (2009) Hydrological change and early human occupation of the Kalahari, Botswana. In, Blockley, S.P.E., Lane, C.S., Oh, A., Ditchfield, P., Bogaard, A., Langdon, P.G., Schreve, D.C., Thomas, D.S.G. and Bailey, R.M. (eds.) Quaternary Abstracts: The human dimension in rapid environmental change. Quaternary Research Association, Annual Discussion Meeting January 2009, Oxford. 19 pp. Meadows, M.E. and Thomas, D.S.G. (2009) Tropical savannas. Chapter 9 in, Slaymaker, O., Spencer, T. and Embleton-Hamann, C. (eds.) Geomorphology and Global Environmental Change. Cambridge University Press. pp. 248-275. ISBN: 9780521878128. Stone, A.E.C. and Thomas, D.S.G. (2009) Former water courses in the northern Namib Desert: new chronologies using OSL. In, Blockley, S.P.E., Lane, C.S., Oh, A., Ditchfield, P., Bogaard, A., Langdon, P.G., Schreve, D.C., Thomas, D.S.G. and Bailey, R.M. (eds.) Quaternary Abstracts: The human dimension in rapid environmental change. Quaternary Research Association, Annual Discussion Meeting January 2009, Oxford. Telfer, M.W., Bailey, R.M., Thomas, D.S.G., Burrough, S. and Stone, A.E.C. (2009) Dated aeolian dune sands: an archive of palaeoenvironments or a victim of stochastics? In, Blockley, S.P.E., Lane, C.S., Oh, A., Ditchfield, P., Bogaard, A., Langdon, P.G., Schreve, D.C., Thomas, D.S.G. and Bailey, R.M. (eds.) Quaternary Abstracts: The human dimension in rapid environmental change. Quaternary Research Association, Annual Discussion Meeting January 2009, Oxford. 64 pp. Thomas, D.S.G. and Bailey, R.M. (2009) Reconstructing Quaternary environmental changes and human interactions in drylands: what are some of the big uncertainties? In, Blockley, S.P.E., Lane, C.S., Oh, A., Ditchfield, P., Bogaard, A., Langdon, P.G., Schreve, D.C., Thomas, D.S.G. and Bailey, R.M. (eds.) Quaternary Abstracts: The human dimension in rapid environmental change. Quaternary Research Association, Annual Discussion Meeting January 2009, Oxford. 66 pp. Thomas, D.S.G., Bailey, R.M., et al. (2009) Late Quaternary Indian Ocean monsoon intensity variations reconstructed from fluctuations in the level of Lake Chilwa, Southern Malawi. In, Blockley, S.P.E., Lane, C.S., Oh, A., Ditchfield, P., Bogaard, A., Langdon, P.G., Schreve, D.C., Thomas, D.S.G. and Bailey, R.M. (eds.) Quaternary Abstracts: The human dimension in rapid environmental change. Quaternary Research Association, Annual Discussion Meeting January 2009, Oxford. 65 pp. Thomas, D.S.G. and Twyman, C. (2006) Adaptation and equity in resource dependent societies. In, Adger, W.N., Paavola, J., Huq, S. and M.J. Mace (eds.) Fairness in Adaptation to Climate Change. MIT Press, Cambridge, Mass. pp. 223-237. ISBN: 978-0-262-51193-3. Thomas, D., Ashworth, P., Neild, J. and Souch, C. (2017) International Benchmarking Review of UK Physical Geography. Royal Geographical Society. ISBN: 978-0-901989-44-4. Middleton, N.J., Stringer, L., Goudie, A. and Thomas, D.S.G. (2011) The Forgotten Billion: MDG achievement in the drylands. UNDP-UNCCD 67 pp. Newsham, A.J. and Thomas, D.S.G. (2009) Agricultural adaptation, local knowledge and livelihoods diversification in north-central Namibia. Tyndall Centre Working Paper, 140.